Catnip-not just for cats. Humans love it, too! Our feline friends are attracted to its scent in both dried and fresh forms. 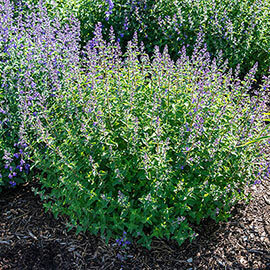 When dried, catnip works as a stimulant in cats, giving them plenty of playful energy. But when nibbled fresh, the leaves have a calming effect on kitties. It has the same effect on humans. 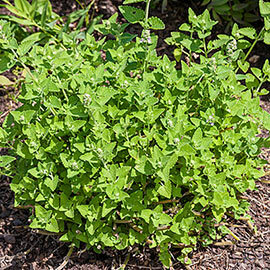 Similar to mint, it has been added to medicinal gardens for generations. Plus, the aroma repels mosquitos. Easy to grow in pots and beds. For best results, plant in full sun. 75 DAYS. For each offer ordered, get approx. 100 seeds per packet. Spacing: Space transplants 20 inches apart. Foliage: Fuzzy heart-shaped grey-green leaves. Flower Form: Spikes of lavender flowers all summer. Soil Requirements: Loose, sandy, alkaline, fertile soil.